OK, game makers. That's enough. We have enough garbage cluttering our living rooms that we don't need any more boards, guitars, drum sets or motion-sensing devices. That includes this skateboard controller for Tony Hawk Ride. 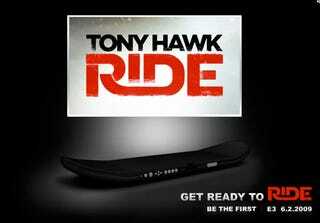 Look, I'm sure that Tony Hawk Ride is a great game and is only made better by a skateboard-shaped control deck. But at some point, people are going to look at their closets stuffed with multiple sets of instruments and boards and plastic crap to attack to their Wiimotes and say that enough is enough. And this one is worse, as it's designed for one game. At least the Wii Fit can be used with multiple games. This thing is shaped like a skateboard! There are only so many uses for a controller like that.